Shaun Anthony Woodward (born 26 October 1958) is a British politician who was the Labour Member of Parliament (MP) for St Helens South from 2001 to 2015. He served in the cabinet from 28 June 2007 to 11 May 2010 as Secretary of State for Northern Ireland. Following the 2010 general election, Woodward was the Shadow Secretary of State for Northern Ireland until 7 October 2011, when he was replaced by Vernon Coaker. A former television researcher and producer, Woodward began his political career in the Conservative Party. He was elected in 1997 as a Conservative MP for Witney, but joined Labour in 1999. Woodward was educated at Bristol Grammar School, an independent day school, followed by Jesus College, Cambridge, where he studied English literature. He also studied at Harvard University as a Kennedy Scholar. From 1981–2, he was parliamentary lobbyist for the National Consumer Council. From 1982–90, he worked as a researcher and producer for BBC TV News and Current Affairs on the programmes That's Life!, Panorama and Newsnight. He subsequently wrote a book about Ben Hardwick. From 1991–2, he was director of communications for the Conservative Party. Woodward was selected as Douglas Hurd's successor as Conservative candidate for the safe seat of Witney at the 1997 election, having previously been a senior official of the party. Elected with a large majority, he was a front-bench spokesman on London for the Conservative opposition under William Hague until 1999, when he was sacked for supporting the repeal of Section 28, a regulation which aimed to prevent the "promotion of homosexuality" in schools. After being sacked from the Tory front bench, Woodward then left the Conservative party to move to the ruling Labour Party, without resigning as an MP. This meant that no by-election took place. He was given a job co-ordinating the Labour party's 2001 general election campaign. Woodward's local Conservative constituency association requested that he resign and run again in a by-election, under the Labour banner, as he had originally won the safe Conservative seat by campaigning as a Conservative. Woodward refused to hold a by-election, and continued to represent his constituency for two years. 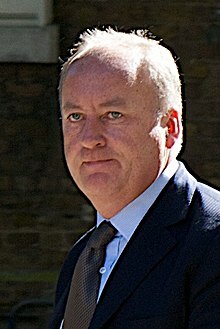 Woodward was criticized by his former colleagues in the Conservative Party, including leader William Hague, chairman Michael Ancram and Michael Heseltine, and backbench Labour MPs Tony Benn and Jeremy Corbyn, and ten years later, in the 2009 political diaries of former Labour government minister Chris Mullin. Woodward's defection was welcomed by senior Labour figures. In the June 2001 general election, Woodward decided not to contest his Witney seat as a Labour candidate and instead found a safe Labour seat in St Helens South. Chris Mullin wrote with shock of "the awful Shaun Woodward" defecting to Mullin's own side, calling "the New Labour elite parachuting [Woodward] into a safe seat ... one of New Labour's vilest stitch-ups ... made my flesh creep". His successor in Witney was David Cameron, who subsequently became Prime Minister in 2010. When news of Woodward's intention to stand reached St. Helens, a strong left-wing challenge was put forward in an attempt to deny the former Conservative the safe Labour seat. Neil Thompson of the Socialist Alliance and Michael Perry of the Socialist Labour Party both contested the St Helens South seat and received a total of 12% of the vote between them. Woodward won the seat with a much reduced 49% of the vote. As a Labour MP, Woodward served on the Joint Committee on Human Rights, and was a prominent supporter of the Gender Recognition Act 2004. In May 2005, Woodward was re-elected in St Helens South receiving 54% of the vote and his majority increased. However, the Liberal Democrats' candidate, Brian Spencer, saw his party's vote increase from 23% in 2001 to 28%. Michael Perry of the Socialist Labour Party contested the seat again and received just under 2% of the vote. After the 2005 election, Woodward was appointed Parliamentary Under-Secretary of State at the Northern Ireland Office. In the May 2006 reshuffle, Tony Blair named Woodward Parliamentary Under-Secretary of State at the Department for Culture, Media and Sport with responsibilities for the digital switchover for TV. On 28 June 2007, in his first cabinet, newly appointed Prime Minister Gordon Brown appointed Woodward as the Northern Ireland Secretary, replacing Peter Hain. Woodward chose not to receive a ministerial salary because of his personal wealth. As Northern Ireland Secretary, Woodward reportedly became a close confidant of the Prime Minister, Gordon Brown. This was largely due to Woodward's previous first hand experiences of the beleaguered Conservative government of John Major. Woodward stood for election to Labour's shadow cabinet, but was unsuccessful. Nevertheless, he was retained as Shadow Secretary of State for Northern Ireland by Labour leader Ed Miliband for just under a year. In November 2013 he announced that he would stand down from Parliament at the next general election, to work on human rights issues. He was praised for his role by then Labour leader, Ed Miliband, who wrote to him: "In 1999, you made an incredibly hard decision to cross the floor of the House and join the Labour party. It took personal courage and political commitment, and our party will forever be grateful to you." He married Camilla Davan Sainsbury, daughter of former Conservative MP Tim Sainsbury of the wealthy supermarket Sainsbury family, on 2 May 1987; they announced their separation after 28 years on 20 December 2015. They have one son and three daughters, including the food blogger Ella Woodward. After leaving his wife, Woodward was reported to be in a relationship with Luke Redgrave, a film cameraman and the grandson of the actor Sir Michael Redgrave. In 2016 Woodward and Redgrave were living together in Sag Harbor in The Hamptons, New York State. In March 2001, he was said to be the only Labour MP with a butler. ^ "House of Commons Hansard Debates for 25 Jan 1999 (pt 13)". Parliament of the United Kingdom. ^ "Tories split over gay rights sacking". BBC News. 3 December 1999. Archived from the original on 4 September 2010. Retrieved 3 December 2008. ^ "Mixed reaction to Woodward defection". BBC News. 18 December 1999. Archived from the original on 21 July 2013. ^ Grice, Andrew (20 December 1999). "Blair rewards defector Woodward with campaigning role for Labour". The Independent. London. Archived from the original on 8 November 2012. ^ a b "Top Tory defects to Labour". The Guardian. 19 December 1999. Archived from the original on 13 April 2014. Retrieved 12 April 2012. ^ a b "Fallout grows over Tory turncoat". BBC News. 20 December 1999. Archived from the original on 13 April 2014. Retrieved 12 April 2014. ^ a b Chris Mullin (2009). A View From The Foothills: The Diaries of Chris Mullin. ISBN 1-84668-223-1. ^ a b "Politics". The Guardian. London. Archived from the original on 9 April 2008. Retrieved 23 May 2010. ^ Porter, Andrew (21 August 2008). "Shaun Woodward becomes unlikely confidant of Gordon Brown". The Daily Telegraph. London. Archived from the original on 12 October 2014. Retrieved 16 September 2008. ^ Watt, Nicholas (7 November 2013). "Tory defector MP Shaun Woodward to stand down at 2015 election". The Guardian. Archived from the original on 19 December 2013. Retrieved 19 December 2013. ^ "Labour MP Shaun Woodward to step down". BBC News. 7 November 2013. Archived from the original on 10 November 2013. Retrieved 19 December 2013. ^ Finnigan, Lexi (20 December 2015). "Turncoat Tory Shaun Woodward splits with wife of 28 years". The Guardian. ^ Moffatt, Andy (5 February 2016). "Shaun Woodward 'moves in with boyfriend'". St. Helen's Reporter. ^ Finnigan, Lext (20 December 2015). "Turncoat Tory Shaun Woodward splits with wife of 28 years". Daily Telegraph. Retrieved 10 December 2016. ^ Buchanan, Heather (September 2016). "An 1840s Sea Captain's Home Is Beautifully Restored". Cottages & Gardens. Retrieved 10 December 2016. ^ Roth, Andrew (20 March 2001). "Shaun Woodward". The Guardian. London. Archived from the original on 15 June 2009. Retrieved 7 June 2009. ^ "The Board of Trustees for the Human Dignity Trust". Human Dignity Trust. Retrieved 28 March 2018. ^ "SHAUN WOODWARD (Chairman)". LAMDA. Retrieved 28 March 2018. ^ "STAFF & BOARD". Hamptons International Film Festival. Retrieved 28 March 2018.